Paddy Power bookies are renowned for their sense of humour, mischief and money-back offers. Despite now being a colossal bookmaking organisation, especially since their merger with fellow online betting giant Betfair, they remain true to their roots with their reputation for fun and fair play as strong as ever. 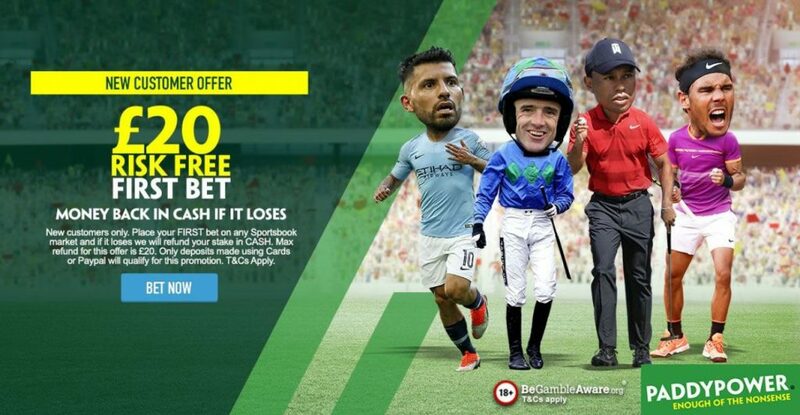 CLAIM £20 RISK FREE BETS AT PADDY POWER! *New customers only, limited to one per person. If you’ve previously had a Paddy Power account, you will not qualify for the offer. Place your FIRST bet on any Sportsbook market and if it loses we will refund your stake in CASH. Max refund for this offer is £20. Only deposits made using Cards or Paypal will qualify for this promotion. T&Cs apply. 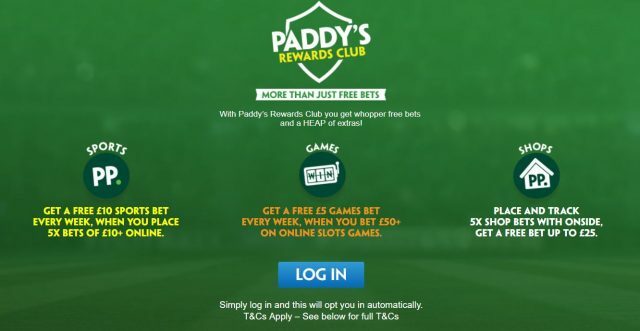 Paddy’s Rewards Club: Get a £10 free bet when you place 5x bets of £10+. T&Cs apply. Paddy Power was founded in 1988 by the merger of the 40 shops belonging to three Irish bookmakers: Stewart Kenny, David Power and John Corcoran. The company grew quickly, floating on the London Stock Exchange in 2000 and operating 195 shops by 2005. By which time Paddy Power had successfully launched online and a little-known fact is the market research conducted before the Irish company decided use their own name for their online activities. The polls showed the vast majority of people questioned believed the term Paddy Power was either a paramilitary organisation or an Irish whiskey! None of those questioned associated it with a bookmaking firm. At the start of 2016 the Irish firm merged with Betfair which gave the combined companies over four million active online customers although both companies currently operate separately. Paddy Power opened their 600th shop in March 2016. Approximately 270 of which are in their native Ireland with the remainder in the UK. Paddy Power all but invented ‘money-back specials’, a concession which sees punter’s stakes returned under certain circumstances – if your horse finishes second to the SP favourite for example. As for Paddy Power free bets and offers, they have a long history of costing themselves millions in early pay-outs – such as 2003 when Paddy Power paid out early on Arsenal winning the Premier League title but Manchester United eventually became champions. They also paid out punters who backed Tiger Woods in the 2009 PGA Championship when he was four shots clear of the field. It was a mistake that cost them over £1.5 million. Similarly Paddy Power are renowned for their impromptu ‘justice payments’ whereby they refund punter’s money when there is what they deem to be an unfair result. This could be a horse that refuses to race or a boxing match where everyone barring the judges believe the declared result was a travesty. Over 42 individual sports and ‘specials’ markets are listed at Paddypower.com. Power’s excel with their ‘novelty bets’ accepting wagers on everything from US politics through to proof of an alien existence. However, like most sites, they excel in football, horseracing, golf and rugby. A typical high-profile football match at Paddy Power will have upwards of 140 different betting opportunities on it. Almost every new successful innovation in online bookmaking has been embraced by Paddy Power from the outset. In this era that includes ‘best odds guaranteed’ and ‘first past the post’ concessions plus ‘in-play betting’, ‘blog’, ‘form’, ‘commentary, ‘watch live’ and a ‘bet calculator’. In addition to taking bets via PC, Paddy Power have an excellent iPhone and Android App. Furthermore they accept bets via telephone (with funds taken from and returned to your online account) plus ‘text bets’. Paddy Power offer countless ways of getting in touch with them regarding your enquiries. This includes a ‘live chat’ facility, 24/7 telephone lines, email and a Twitter feed. 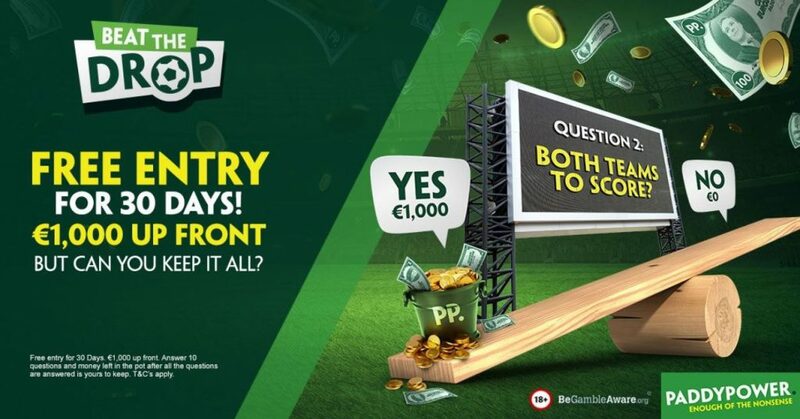 Every popular and common deposit and withdrawal method is accepted by Paddy Power. This includes all major cards plus PayPal, Neteller, Skrill and bank Transfer. Transactions are free and the minimum deposit is £5. It is extremely hard to fault Paddy Power albeit we do have a few reasons to nitpick meaning we are giving it a score of 4.5 as we are aware some customers can have their bonus offers and things like Best Odds Guaranteed revoked, which is very un-Paddy like. A few more deposit/withdraw methods would not go astray either, particularly PaySafe which is becoming increasingly popular. Similarly some markets, particularly the obscure ones, can be subject to restrictive bet limits. On the considerable flip-side, you can bet directly into Tote pools, Paddy Power offers industry leading prices and they price-up considerably more markets in more sports than their rivals. The newly re-designed site (as of February 2018) is very easy to use, and it is complimented with a straightforward ‘Help Centre’ and their customer service is both prompt and thorough. Register with Paddy Power and claim your £20 risk free bet!